Can I Improve the Way My Smile Looks? This is a question millions of people have every day, and for the people of Harbor East, we’re proud to say “yes!” With a wide array of aesthetic dental services, our cosmetic dentists can eliminate flaws that have bothered you for years, give you the smiles of your dreams, or both! All of our treatments can be tailored to your exact needs, and the end result will always be a smile that is just as beautiful and unique as your personality. Our goal is to provide minimally invasive dentistry to create your beautiful smile. Often, this can be provided with aligning your teeth with Invisalign, bleaching and enamel replacement with porcelain veneers. 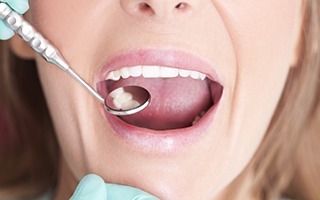 Can Porcelain Veneers Fix Chips and Cracks in My Teeth? Porcelain veneers are designed to look just like your natural teeth and can transform your smile without braces or surgery. They can cover up chips and cracks in the teeth, mask worn tooth enamel, and cover up teeth that are permanently stained. Porcelain veneers are very thin in construction and are virtually undetectable; they are also highly durable and strong. Porcelain veneers can last more than a decade before they need to be replaced or repaired. Will Metal or Porcelain Crowns be Used to Fix My Teeth? If one of the teeth that shows when you smile is damaged or decayed, we will never fix it with an unnatural-looking metal crown. At our practice, we can offer metal-free restorations that make your smile look like nothing ever happened to it. They will be made of dental porcelain, meaning they won’t just look great, but they’ll be strong and durable like real enamel. Plus, they won’t make your teeth more sensitive to hot and cold temperatures, and they can even work for patients who have metal allergies. Can Dental Bonding Fix Gaps in My Smile? This is one of the most common cosmetic issues we see every day, and fortunately, we have a treatment that can fix it in just one visit! It’s called direct bonding, and it’s one of the quickest and easiest cosmetic treatments available today. For this, your doctor will gradually apply layers of a tooth-colored resin to your teeth until the gap is gone. After you approve the final look, they’ll harden it with a special curing light, and your new smile will be ready for the world! You’ll be amazed at how natural the results look. 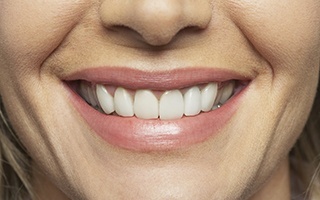 Often, the gap can be eliminated with tooth alignment using Invisalign. Can I Whiten My Teeth in One Day? Enhance your smile with professional teeth whitening in Baltimore, MD! In-office teeth whitening services can whiten your smile by several shades and boost your self-confidence. They are much more effective than over-the-counter products. Let us take care of tooth discoloration, stains, and other minor flaws with the innovative Zoom! Teeth Whitening system that can whiten your teeth in less than an hour. You certainly can, and we don’t mean with one of those generic, store-bought whitening kits. At Harbor East Dental we can make you your own customized whitening kit. It will consist of mouth trays designed to fit your particular teeth and a potent whitening gel (much stronger than anything you can buy on your own). You’ll just need to use the kit as instructed for about 2 weeks to make your smile up to 8 shades whiter. However, if you don’t want to wait that long to have a bright, shining smile, we can offer you a complete treatment right here in our office. With Zoom! Whitening, we can take away years of stains and make your teeth whiter than even in as little as 45 minutes! 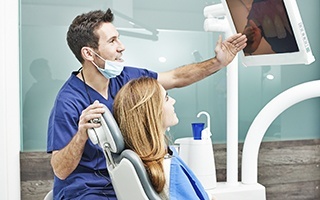 What is Virtual Smile Design? 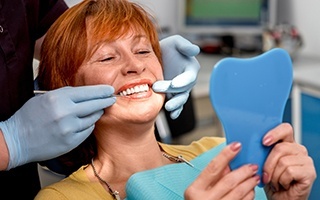 Choosing to alter the appearance of your smile, even for the better, can be a big decision, and it would be great if you could see what the results would look like before you got a particular treatment. We use the iTero digital scanner, and if you are a candidate for Invisalign, you can preview your new smile immediately. With our Virtual Smile Design, that’s exactly what we can do. Using pictures of your smile and our own in-house software, we can give you your own “before and after” photos to show you what your smile would look like after a particular treatment. If we elect to do porcelain work, we can create a wax up of your teeth and place a composite mock-up on your teeth, so you can visualize the end result before work is initiated. This will help us make sure we’re giving you exactly what you want, plus you’ll have a chance to ask for any small adjustments you like.